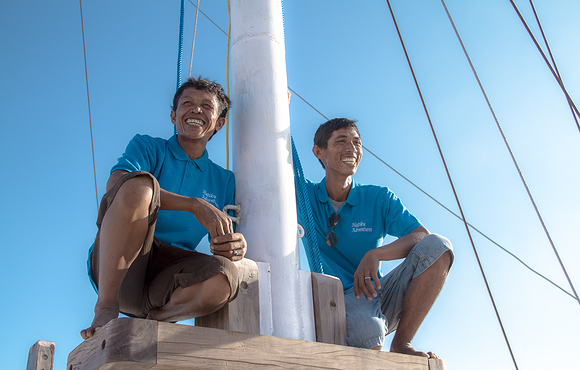 Our very experienced Cruise Manager and fully associated Dive Masters will safely guide you through the marvels of the underwater world, wherever in Indonesia you join our adventure. A full dive brief is given to the divers beforehand at the stern of the boat, and then all their gear to be loaded onto the tenders to take 2 groups of 6 out to the dive site. Once the dive is concluded the tenders return to the boat where the staff will rinse the gear, there is a separate rinse tank for the cameras. The gear is hung up to dry between dives. Time to enjoy a snack and a cold drink, relax and get ready for the next. Please do enquire as to her availability from the 1st of January 2019. 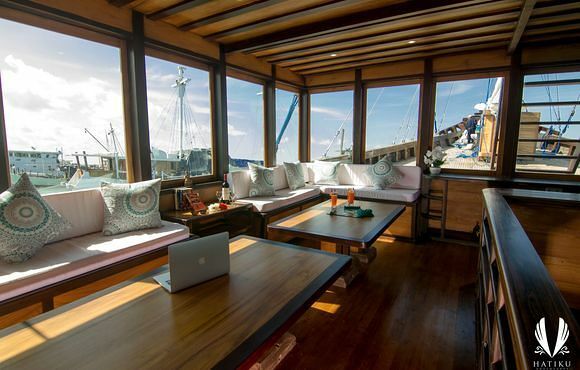 The Hatiku is a classic Indonesian Phinisi built from handpicked Teak and Iron Wood made by famed boat builder Haji Wahab and given a modern makeover in design and facilities to make this one of the most comfortable and stylish liveaboards now operating in Indonesia. 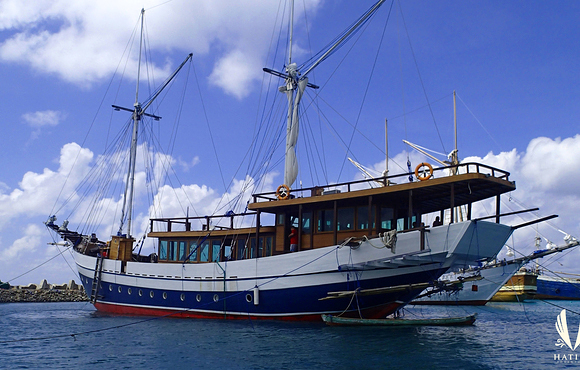 At 38m long and 9.3m wide she is a spacious vessel and has been finished with an attention to detail. The cabins feel large and spacious thanks to the revolutionary design of lowering the floor level. 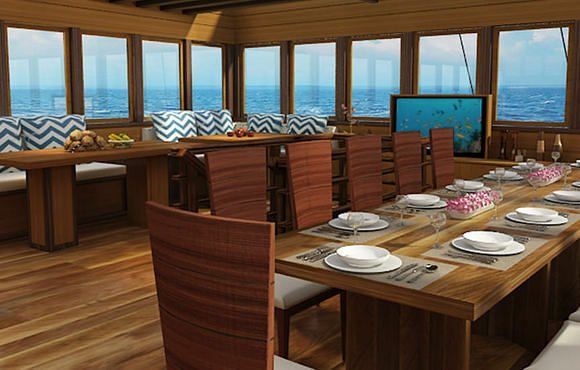 The Hatiku provides ample room in its 6 double cabins, generous deck space and communal areas for up to 12 divers. Fitted out with all the latest safety, technical and entertainment equipment she combines old world style with modern amenities to deliver a truly outstanding vessel to the discerning diver. 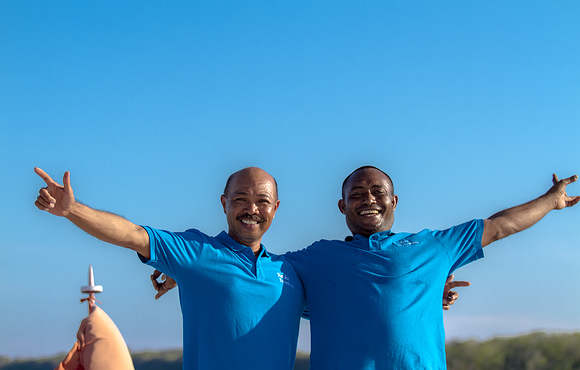 Each of the 6 double cabins is equipped with a double or twin bed, individually controlled A/C units, en suite bathroom with a hot and cold water shower. The beds are substantial, 2m long by 1m wide to comfortably accommodate the tallest diver. There is an individual cupboard for each person’s personal belongings, and plenty of storage under the bed. The salon is tastefully laid out with dark teak wood and white drapes, with full A/C it provides a comfortable place to relax out of the heat of the day while blocking none of the view. 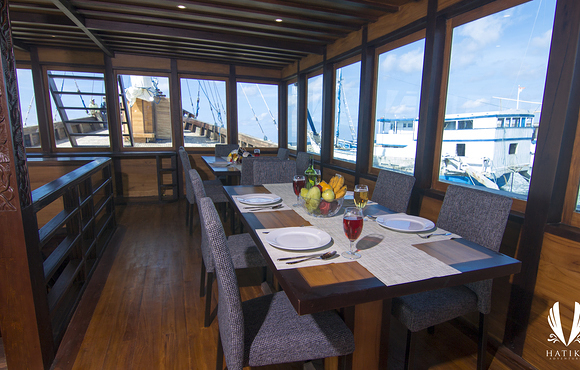 Meals are also served here, but can be taken out to the deck or sun deck to eat, the food is blend of Asian and Western cuisine to allow for the best of both worlds. The fully stocked bar serves tea, coffee, soft and cold drinks throughout the day, beer wine and spirits in the evening. At the aft of the boat a purpose built camera and briefing room can be found to the stern of the wheel house. Two camera benches, each for 3 cameras or one room have been built with all the necessary charging points and outlets. The dive briefings also take place here either on the stern deck or in the camera room. 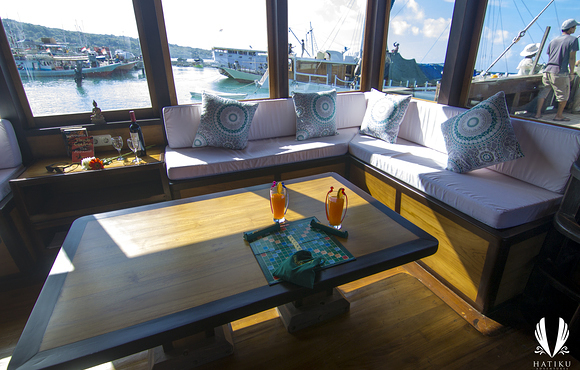 The shaded stern deck with its large comfortable cushioned seating area is the perfect place to chill out between dives or watch the sun set with a cocktail. 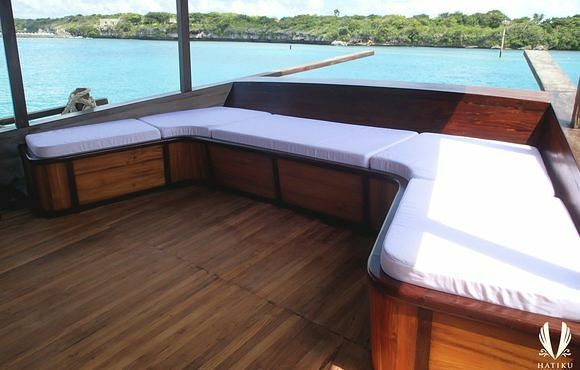 The main deck, partially shaded provides room to relax and lounge about, it also is the storage and hanging area for the dive gear and rinse tanks. A fresh water deck shower and convenient toilet are also found here. The very large sun deck on the third level is an ideal space for those wanting to lie out and enjoy the tropical paradise slip by. Price is per person and based on double occupancy. Price may vary based on departure date. Please do enquire as to her availability from the 1st of January 2019. 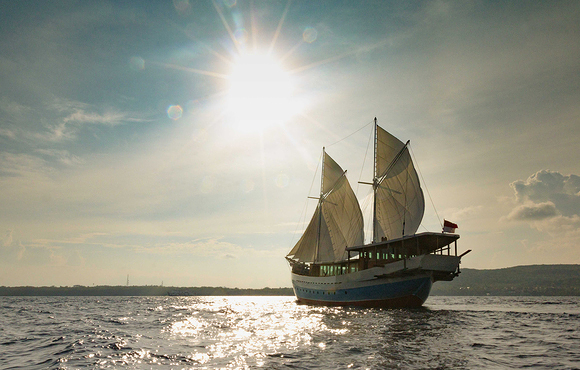 The Hatiku is a classic Indonesian Phinisi liveaboard boat built from handpicked Teak and Iron Wood, in Kendari, South Sulawesi, by famed boat builder Haji Wahab.